It’s especially helpful when looking at the practice of starting and parking a car in NASCAR’s top three series. Some teams choose to qualify for the race, then run only a handful of laps and collect a considerable check. It happens most often when the entry list is a little short, and in tough economic times. It’s difficult to prove because few teams open admit starting and parking. The official reasons for their falling out of races after a few laps sound dubious “brakes” or “handling” or something of that nature. A look at the payoffs from the Kobalt Tools 500 at Atlanta Motor Speedway several races back seems to indicate that for teams at the back of the pack the smartest move financially is to park as soon as possible and save the $1,700 or so that would be spent on every new set of tires as well as the wear and tear on the car and engine. 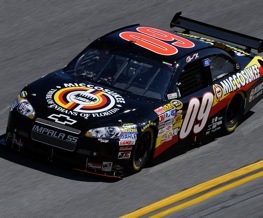 Mike Bliss started James Finch’s No. 09 Dodge after running a minimal amount of laps in practice, then headed to the garage after 21 laps. The official reason for his departure was listed as “overheating.” His pay – $70,141. David Gilliland ran all afternoon, and although he was four laps down he was running at the finish. He finished 24th and earned $73,200, not nearly enough to justify the cost of tires and wear and tear on the car. A.J. Allmendinger was 17th and running at the end and earned $77,825, $7,684 more than Bliss and not enough difference to cover even the tire bill, let alone the far more expensive engine tab. It’s also worth noting that the purse isn’t all about performance in a particular race. There are various plans that reward long-standing teams for their past successes. Reed Sorenson finished 33rd, but still earned $109, 257, while rookie Joey Logano earned $121,551 for finishing 30th, in large part a reward for his No. 20 team’s results when Tony Stewart was the driver. Winner Kurt Busch got $164,175. Starting-and-parking in the Camping World Truck Series often consists of one team simply unloading the backup truck and running a few laps to help support the primary truck. The pay structure in the truck series doesn’t make a stand-alone start-and-park effort feasible. Clay Rogers finished last in the truck race at Atlanta and earned $7,990. Still, that produced a better result financially than Gabi Dicarlo, who ran the entire race, finished 24th and earned $8,355. The difference in her pay and Rogers’ wouldn’t buy a single set of tires. Race winner Kyle Busch picked up $56,300. Lately, the start-and-park team owners privately admit that they’ve begun to race each other, trying to be the highest finisher in class. Finch had Sterling Marlin in his car at Martinsville and was 15th fastest in practice, but when rain washed out qualifying, he lost the starting spot to Todd Bodine’s Larry Gunselman, who was tied with him in points but had a better race finish to take the tie breaker. Now it seems that NASCAR has taken on the flavor of a sports car event where you have races within the race, where teams with varying goals and budgets run against each other with no real interest in the other group. It’s not particularly pretty, as things often aren’t when money is a big factor. Alot of people are against start and park but personally I have nothing against it. This article couldn’t have said or explained it any better. Not every team is a power house.